Creative is introducing a light weight, low-end flash-based player to go up against the Apple iPod Shuffle and it look like a polished precious stone. 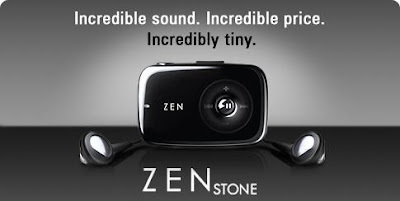 It has features like plug-and-play capabilities, simply download Creative Media Lite(Microsoft® Windows® XP (Service Pack 1 or higher) / XP 64-bit, Microsoft® Windows Vista™) for free, and connect via USB to your computer to transfer music or data files, manage your ZEN Stone's contents or perform other essential functions. Updated on 06/05/2007, managed to see a Black Zen Stone on the shelf next to Apple iPod Shuffle! See the size of the Stone? its actually comparable with iPod Shuffle, incredibly tiny. Selling at an retail price of S$69 or US$39.99, it is only half the price of iPod Shuffle, it's definitely a cheaper alternative. Not only that, you get a free earphone too. Powered by just two AAA alkaline batteries, you will enjoy 20 hours of music entertainment. Another improvement in this new Creative Labs MP3 player is the driver installation, this player do not required massive CD installation for it to work. For example the Zen V Plus Installation CD is very huge, it has a massive size of about 550mb. However, for the Zen Stone, no CD installation is required and you can download the Creative Media Lite here at 22.9mb only. Because of its small size, it can be easily downloaded from the website. And you do not have to worry when you lost your installation CD or have a defective CD when installing the software. I love tо ѕtuԁy the trivia of these thingѕ, that's what makes this site really tick over. Things other writers leave out.